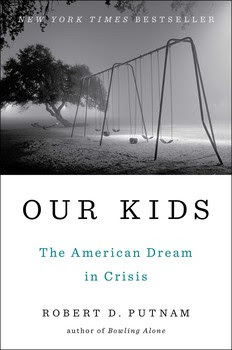 Kudos to Robert Putnam who not only writes about important societal issues, but also advises policy makers through a research initiative he co-founded on closing the opportunity gap. Well-known for Bowling Alone, written fifteen years ago, he has now come out with Our Kids, which analyzes the class gap between high and low socioeconomic background in terms of family, parenting, schooling, and community. Our Kids is a step in the right direction towards advocating for not only the kids we raise ourselves, but all kids in the United States. Putnam uses level of completed education as the primary indicator of disparity. This surprised me because my understanding prior to reading this book was that even having a college degree was no guarantee to get a decent paying job nowadays. Jennifer Silva travelled around the country, interviewing families of different classes who lived near each other. Putnam then used these profiles to depict more quantitative data. When I read Putnam's opening chapter The American Dream, I wasn't sure what new vantage point he was offering. Yes, we know that there is a growing chasm between the haves and the have-nots. But the rest of the book offered up a new way of looking at this problem. For example, we have all heard that the divorce rate is up to 50%. However, when disaggregated by class, low socio-economic background divorce rates have increased, while high socio-economic background has actually started to taper off. Another finding I found surprising is that across the board, those with the same class backgrounds had more similar backgrounds to each other than those who lived near them. This was true even when considering racial differences. Class-based differences had more far-ranging impact than racial differences. When looking at school disparities, Putnam found that the institutional differences such as per pupil spending weren't really what was affecting student success rates. Instead, it was the classmates and their difficulties that made the difference. If a kid has a majority of classmates who grew up in abusive circumstances, that kid was more likely to fail even if he or she did not have abusive circumstances themselves. Putnam offers some surprisingly simple solutions to combat the disadvantages many families have. One is for schools to offer extracurricular activities without "pay-to-play" requirements. Extracurricular activities have been found to promote leadership skills and are a good predictor for success in college. This book is a good antidote for feeling entitled or being discouraged, depending on where you land on the socioeconomic spectrum. Feeling entitled may make you take for granted good aspects of your life. On the other hand, if you're discouraged, you may blame yourself instead of your circumstances. If you're able to become aware of what has you trapped, you may find your way out of the trap. Either way, this book will help you to see that what you initially thought was your fault, may be more deeply entrenched in your circumstances than you had previously realized.